A good dish for fibre, protein, omega 3 fats, vitamin B12, vitamin D and Niacin (a B vitamin) low salt too! This dish was inspired by the late night snack of salmon and french bread with a creamy sauce that my husband and I used to have after we had been out jiving pre kids!! This is a healthier version of that post dance feast but still with plenty of taste. 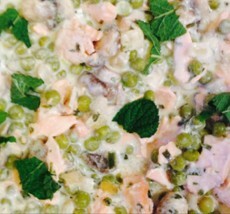 Allow the mushrooms to soften slightly then add the creme fraiche and frozen peas. Put the salmon in a microwaveable dish and cook on full power for about 2 minutes. Lift the salmon off the skin. Discard the skin and fork the salmon into chunks. Add the salmon to the creme fraiche mix, squeeze in the lemon juice and stir. Chop the tarragon and stir through. Serve with wholemeal pasta or wholemeal cous cous and a side salad.